My mom will be happy to know that I finally broke out the nice tea set she gave me three years ago. I guess I was waiting for a special occasion: the making of my own, homemade chamomile tea. These are the German Chamomile flowers I picked from my garden recently. I've been setting them out to dry on a sheet of wax paper. I think I finally have enough to fill the tea ball, just in time for Weekend Herb Blogging. The blossoms have a wonderful light apple scent. The tea itself has a very delicate flavor, almost like it has a touch of honey. 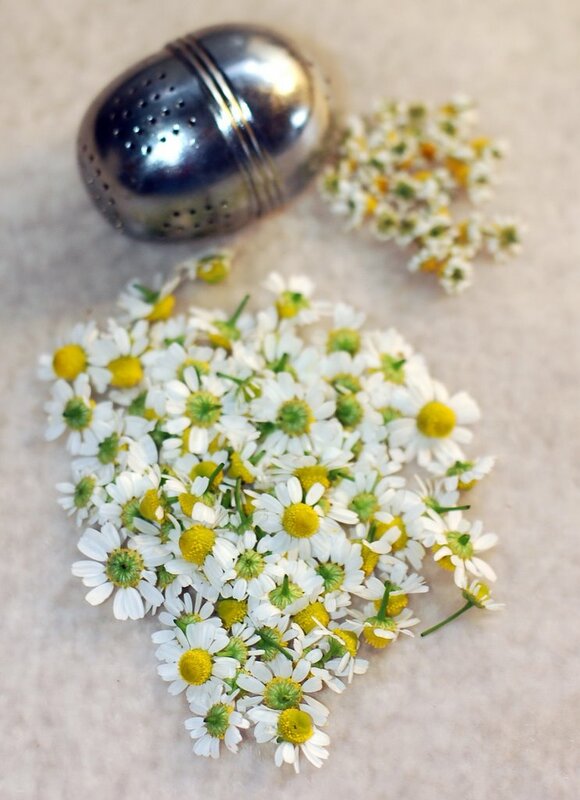 Chamomile is renowned for its calming properties. It is said to help relieve insomnia and cure stomach ailments. 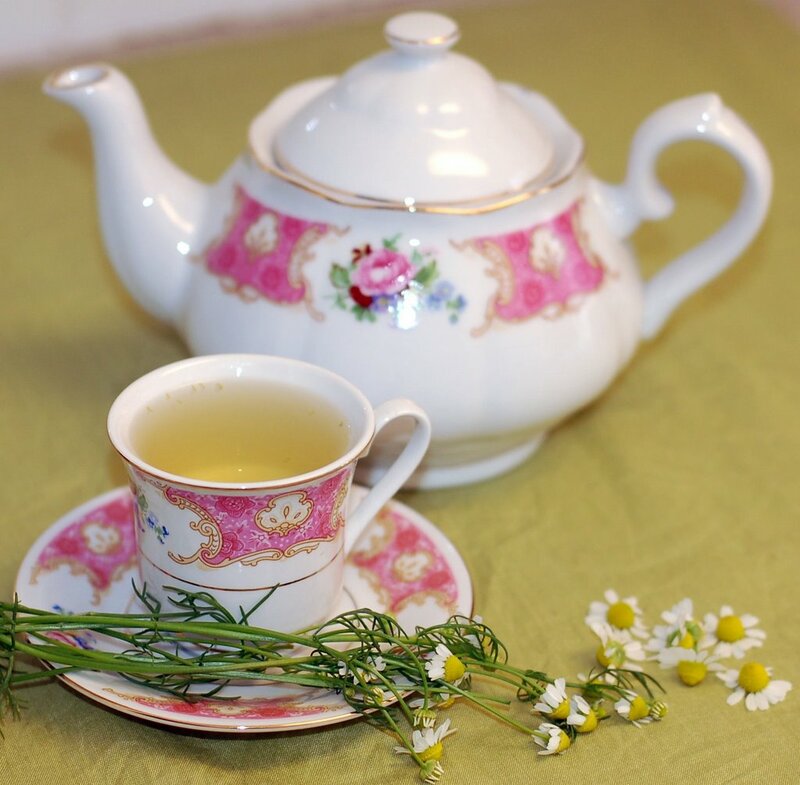 In the New Book of Herbs, author Jekka McVicar mentions that chamomile is sometimes called the "Physician's Plant," because it helps revive sick plants that grow nearby. When I lived in Ecuador as a student, my host family went to the garden every time I felt sick with a stomach bug. They went to get manzanilla (pronounced "mahn-zuh-KNEE-uh"). They used it to make a tea. I thought manzanilla was something unique to Ecuador -- an exotic herb cherished by the ancient Incas perhaps. When my host mom gave me the tea, I had no idea what I was drinking. But when in Ecuador, you do as the Ecuadorians do, and so I smiled politely, said muchas gracias and drank up. And wouldn't you know, the manzanilla always made my stomach feel better. It was not until I returned to the States that I realized manzanilla was just plain old chamomile. So to this day, I still think of chamomile as the exotic manzanilla, and I enjoy it because it is just plain good. I love the idea of making your own tea from flowers you dried. In Utah, chamomile tea was an old pioneer remedy, and I remember my grandmother making it for me. I love the idea of tea making too. Your photos here are really beautiful. I love chamomille tea. I saw some chamomille seeds and thought about planting them and forgot. I should try this. I forgot, I added a green sauce and chimichurri recipe after your comment on my blog, enjoy. Thanks, Empress Melissa. Steve, I'll stop by your blog soon to check out those recipes. I loved reading your childhood memory about this, too -- great stuff. This was such a pleasure to read! I loved looking at the pictures and it made me want to make my own tea. Thanks! Thanks, Genie and Sher. I'm happy that I've inspired you to make tea. I've never used lavender flowers. Let me know if you try and how it works out. I love the thought of making my own tea, your photos are absoloutely stunning.. and the recipes look great! I love your photos! I lived in Ecuador and Chile and I drank manzanilla all the time too! You've inspired me to try this here at home. Stupid Question maybe but I want to make some seeds from my chamomille flowers. To pass the seeds to friends. But i don't know where the seeds are located or how I can remove them. Can someone please email me and tell me. Thank you. The seeds are in the center -- the yellow part -- of the flower. Leave the flowers on the plant until they lose their petals and begin to dry. Then you can clip the yellow "centers" and save them in an envelope or jar. Break them apart and you'll find the seeds inside. Ha ha ha. I absolutely love how you thought manzanilla was this really special tea. I always thought the same thing whenever my full-blooded italian grandmother would pick them each spring and summer. She would always make something good with the manzanilla. I thought she was the only one who could grow them, like they were some sort of secret no one knew about. But one day I had some chamomile tea and I was wondering why it tasted so familiar! It was manzanilla!!!!! lol Thanks for the tips.. I have some great ideas on how to use manzanilla.. we should trade! Your blog is fantastic and your photos are great and I'm sure your mom agrees you have put the teapot and set to great use, there is some great info about the benefits of chamomile tea at www.vitalitybliss.com as well as heaps more info on natural healing, have a look and see what you think. My only question is: when do you cut off the flowers, and how do you preserve them for future use? My wife uses chamomile tea every nite for gerds!Praise God it works. I dry the flowers and leaves on a cookie sheet in a warm oven-170*- remove stems completely from flowers and leaves and the tea is sweet and delicious!Caution-green leaves only!Brown tastes bad!Stems are bitter!